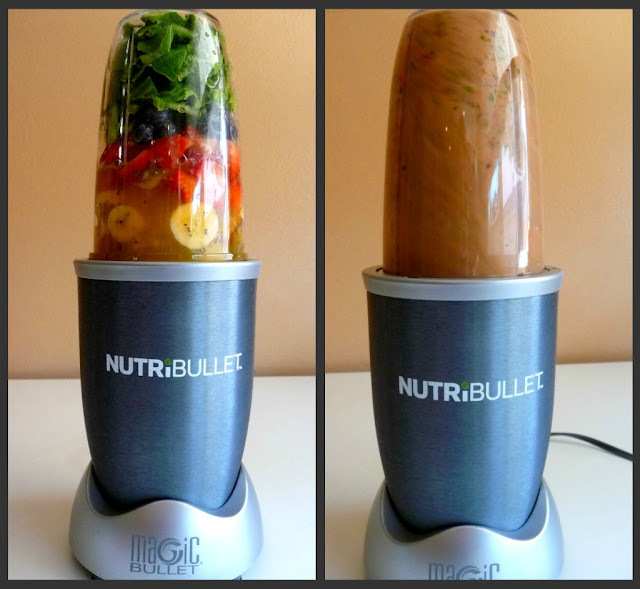 I recently purchased a new toy, the NutriBullet, after watching late-night informercials on TV. It took me weeks to convince myself to buy it, but I finally gave in. And boy am I happy. 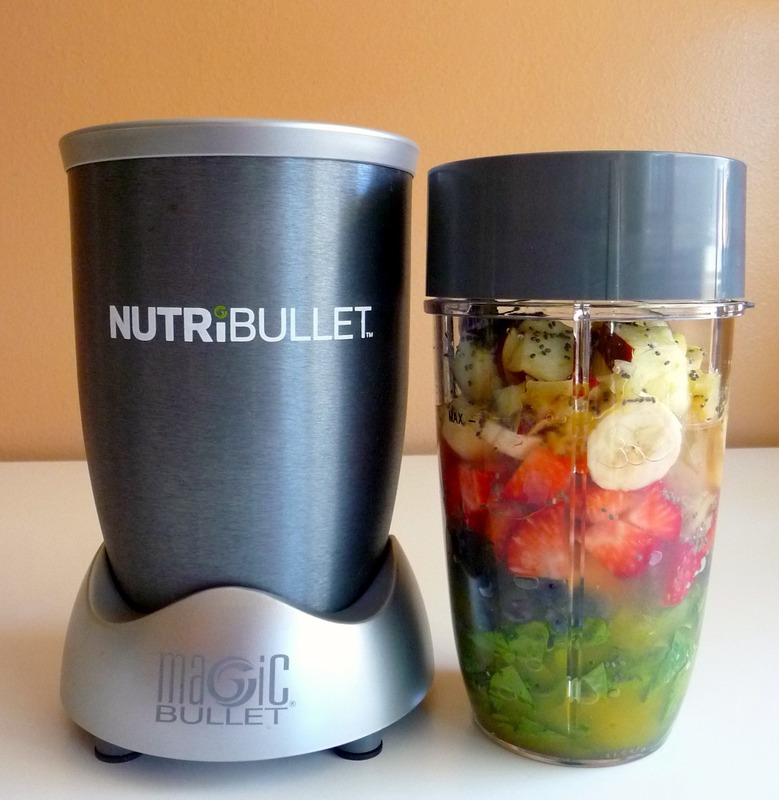 The whole concept around the NutriBullet is to introduce fruits and veggies into your diet by way of "extracting" as they call it through this machine. It's different than a juicer because a juicer discards the pulp, while this one extracts everything into a drink they call "Nutriblast," that is highly absorbable by our body. While I do eat veggies, it is not always my first choice on the menu. This one allows me to eat fruits and veggies together everyday. This product also slowly introduces your body to a new way of eating by starting you off with mild flavored veggies in the beginning, and slowly work your way to the more potent tasting vegetables. 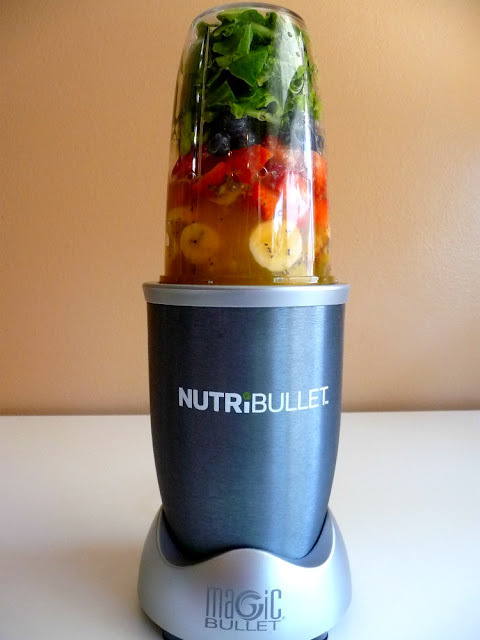 For starters, they want you to mix 50% veggies, 50% fruit, add water, "blast" and that's it. If you want more information on this product, go to www.nutribullet.com. 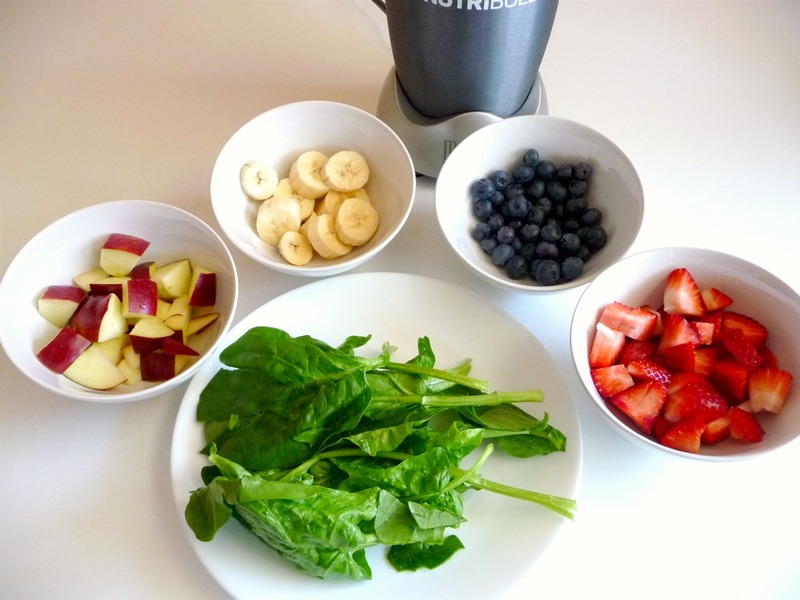 Ingredients: Apples (with skin, no seeds), bananas, blueberries, strawberries, and a handful of spinach. All of the above ingredients are fresh. Put the softest of the ingredients at the bottom of the cup, with the hardest ingredient at the top. That makes the hardest ingredient closest to the blade. Here I started with spinach at the bottom, followed by blueberries, strawberries, banana, apples and chia seeds. Fill the cup with water to Max. line. Although NutriBullet recommends to use water, I did add the juice of two small freshly squeezed orange juice. Cover the cup tightly with the blade extractor and you are ready to "blast." Place the cup on the machine, turn onto the base, and watch the ingredients blend as they get "extracted." 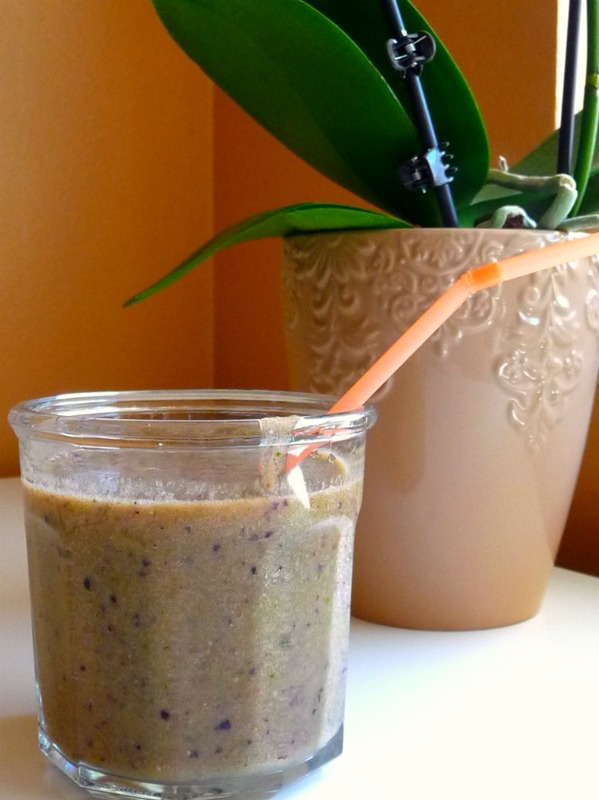 A really delicious, healthful, and filling drink that I really enjoy. I believe you will too. 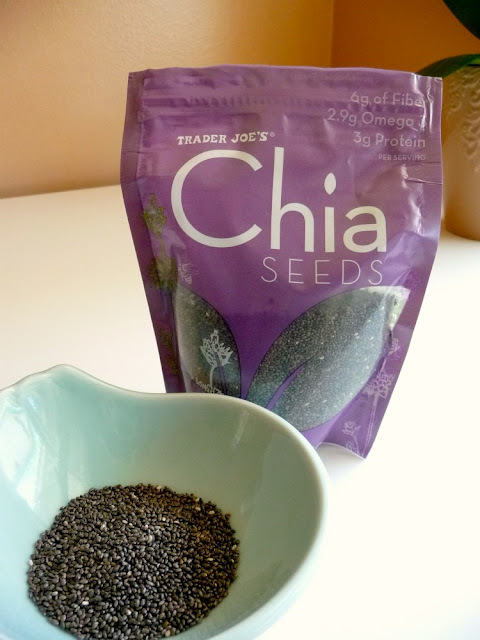 Looks like another good source of omega 3. But' me I will stick with my krill oil supplement. i love that that this thing actually grinds up the skin, seeds, pulp and all almost 100%--however, I do NOT like that for some reason--even when i am certain i have the top or actually the bottom on TIGHT--sometimes it still leaks and drips into the mechanism...and this is going to kill the darn thing sooner rather than later because the only way to clean it is to run water on it. NOT GOOD for such an expensive item.